Australia is behind the rest of the world with its commercial creativity because “most marketers are crap” and scared, Andrew Howie, group marketing manager at Meat & Livestock Australia, said. 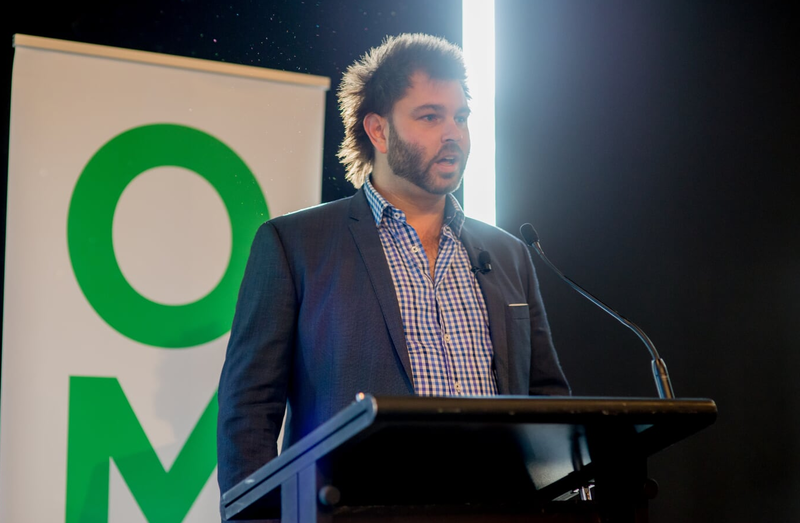 Speaking at a debate to launch the Outdoor Media Association’s Open3 book, on whether Australia is slipping behind the rest of the world, Howie said most marketers “just want get paid and go home and pay off their mortgage and spend time with their family and then go to work the next day”. “Strategically marketers aren’t great here, we don’t spend enough time with world-class planners. “We change too often, we are not strategically led, we think that a great TV ad will solve our business problems,” Howie said at the OMA breakfast to launch its Open3 book, held in conjunction with Mumbrella. The marketer who worked on the headline-grabbing ‘You never lamb alone’ Australia Day campaign made the analogy that marketers are like swimmers – they don’t want to swim outside the pack and get eaten by a shark. “If you swim in a pack, or in the middle, you will probably get kicked in the face or in the leg, but you are not going to get eaten by a shark. “But you are also stuck in a pack the whole time, but if you swim on the outsides or you swim out in front, then you’ve got some clear water and you can actually go places but you are more likely to get eaten by a shark. “Most marketers don’t want to get eaten by a shark, they just want to get paid. “We just have to make everyone swim a little bit faster in the middle of that pack and make a little bit more space, and that doesn’t come from winning awards or showing how many bloody awards we’ve won, what it comes from is trying to build a culture of that middle tier just being a little bit better. “If we could make everyone just a little bit better, maybe that’s through craft and helping them understand the benefit of craft or coaching them on the benefit of time,” he said. In order to produce the best creative work and catch up to the rest of the world, Howie also said CEOs and marketers should leave the creativity to the creatives and focus on the data, insight and strategy. “CEOs aren’t always creative, most of them aren’t, and good ones will leave you alone and go ‘Tell me what the strategy is, help me understand why, the data, evidence strategy behind it and you draw a big line there and you trust they are going to deliver on that. “If I can show that the data, insight and strategy has been achieved as a result of the work then that line stays there. As soon as I mess it up, they start coming below that line, so my job is to keep them above that line,” he said. Carmen Bekker, owner of Wolverton Gardens and former partner of JWT London, simplified Howie’s point to say all marketers really need to have are the tools to be able to prove that creativity works. Meanwhile, the CEO of the Outdoor Media Association, Charmaine Moldrich said what is affecting our creative outcomes, and what marketers, agencies and brands are “sometimes forgetting” is the audience. Diversity was offered as a solution by Moldrich as she urged the industry to be more diverse in order to reach and reflect the real audience. 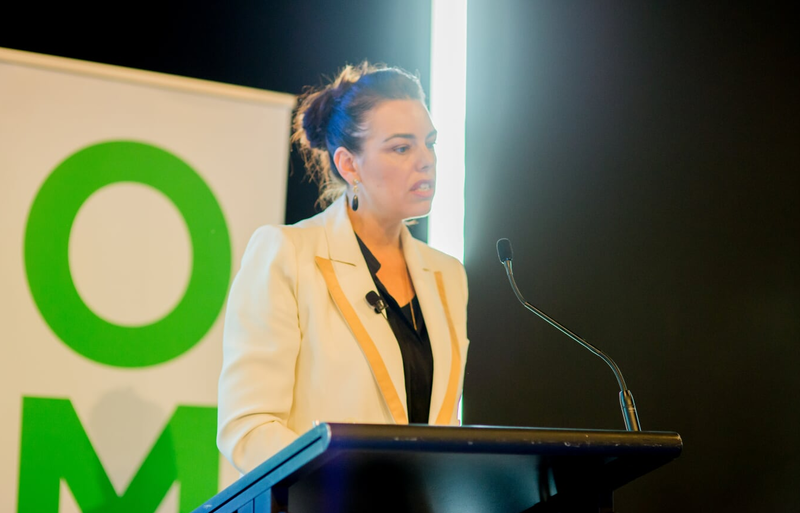 “All of the stuff that is published in Mumbrella and in the trade press, all of the pictures are of blokes who are CMOs and creative directors, they are usually all white blokes. “We really need, as an industry, to start looking at diversity and talking about diverse audiences,” she told the room. Moldrich said once adland delves into the diversity topic and begins to accurately reflect the people in the industry and wider Australia, the work will start to flourish and correctly target audiences. “If that power only sits with a percentage of the audience, you’re not going to get that full force of creativity. “Australia is really stuck,” she exclaimed. Alison Tilling, head of planning at BMF, concurred saying understating your audience and what they are going to respond to is a craft. “You have got to get out of the bubble and interpret it a bit. “People are still people and it still starts with the understanding of them,” said Tilling. Bravery was another topic addressed during the debate and another reason suggested for why Australia has fallen behind the rest of the world in commercial creativity. OMA’s CEO Moldrich, said: “Work has improved in Australia but I think we are also really constrained by regulation in Australia. “It is not just about money, it’s also about the idea, it’s about how brave the client is and it’s about how brave we are as a community. “Because we’ve done the best work and the worst work, sometimes the regulators take over and you get this bland outcome. Don’t let the bland and the mediocre run us, let the brave idea run us – sometimes that is going to work and sometimes it isn’t,” Moldrich argued. BMF’s Tilling was quick to agree, saying long-term relationships between agencies and brands is going to help clients be braver. “When we have those long relationships between partner and agency, when we have campaigns in the advertising world that run for a while, when you really embrace that consistency that’s what gives you the confidence to be brave,” Tilling said. With Collective’s creative director Simon Fowler disagreed with the statement that Australia was behind the rest of the world, citing storytelling, innovation and talent as areas where Australia is far from behind on its production of creativity. “People in our industry are disrupting the way our world is thinking about advertising and then inspiring them to do the same. “If the work doesn’t speak for itself, the people do. We bolster some of the best creative talent in the world,” he said. Moldrich disagreed: “The difference between Australia and the rest of the world, especially in Europe, is that the general work, the bread and butter work, the standard’s higher. “We need to raise the bar so that advertising and creating becomes the enemy of the mediocre and bland and embraces creativity in a way that’s at the heart of our clients’ success,” she said. I’m most offended by the fact that Howie thinks most marketers are crap and lack passion and drive!! As someone who has worked as a Marketing Manager for 15 years and strives daily, it makes me sad to think that someone [edited under Mumbrella’s comment moderation policy] working in a meat market, can make such a broad sweeping statement and get away with it! How about acknowledging the great work that many do instead of putting us all in cattle class!! If his provocation inspires at least one marketer to “have a go” and prove him wrong, then I’m all for it. Hey Jennifer – care to share any of the brands/campaigns that you’ve worked on over the past 15 years? I’ll bet you can’t prove Howie wrong. CEO of Outdoor Media, Charmaine Moldrich, dives into the trendy diversity world and pumps it as the answer to crappy marketing. To stress the point she notes that most marketing CEOs and creative directors are ‘usually white blokes.’ It could be argued that Ms Moldrich’s solution to the white bloke problem is take ‘em on by [edited under Mumbrella’s comment moderation policy]. The predictable comment of all predictable comments, and about as effective as throwing a pork pie at a runaway train in the hope of derailing it. Don’t worry, I am only giving my opinion here, and yes, I am after all, only a white bloke. The answer to a huge chunk of the problem with creative marketing, and with a number of other creative areas, is the combined corporate myth, which includes [quote] “Howie said most marketers “just want (to) get paid and go home and pay off their mortgage and spend time with their family and then go to work the next day”[unquote] and the notion that there is an innovative corporate answer to this, a power-point like training course or a paid up summit that can fix all ills. Sorry, but you have to get off your chuffs and start working from the ground up, Men and Women together, must begin to embrace the origins of creativity, begin to welcome words and language, harness emotions deeper than Mother’s day, and get beyond footy as a force that unites us all. Dare to be proud, dare to be sentimental, dare to be romantic and whimsical, even dare to be a nerd occasionally. It might help if there are actual trained marketers in leadership position not Accountants, Salespeople, Engineers, Mathematicians, “Communicators”, Historians and popular with the Board, CEO types or someone operating at the peak of the Peter or Penny Principle. Industry 4.0 and customers have changed. Let’s change the discussion to benefit marketing and marketers not the ad agencies, media mavens and creatives. Shock! – someone is ‘offended’. Are you offended because Howie said it, or because you know it’s true? Ritson says it, Howie says it, Newton says it – any marketer worth their salt knows there is a culture of mediocrity in Australian marketing. Time to stop being offended and start being better. I’ve worked with only a couple that can make brave decisions, ditch research and go with their gut instinct. And we went on to make famous and effective work for their brand. Too many marketing departments at the moment are filled with humourless, box tickers. Effective and charming communications just can’t survive the gauntlet that has been created. “…as someone who’s worked as a Marketing manager for 15 years.”… Ha ha ha. You just summed up the Howie’s argument so well. Career progression much? Can only be grateful I didn’t pay good money to hear this. Andrew Howie that’s like saying All ducks have feathers – A cockatoo has feathers therefore he must be a duck. And as for the rest FFS…. as if people haven’t been aware that you have to know your audience – I think Jesus worked that when he gave out the loaves and fishes. If that’s the best debate that could have been cobbled together – the other ideas put forward must have been really thin on the ground. It was a free event. Australia use to be up there with the best. In fact much of our talent would be pinched by the UK. People are so caught up with policies and procedure, worrying what the competition is doing and it is sucking the creative juices right out of our backsides!!! Dare to be creative! Those who dare win. In my experience of the last 11 years working in Australian Ad Agencies and 10 years before that in the UK. Most Australian marketers are completely terrified when faced with brave thinking. Every year, their comfort zone becomes smaller and smaller. NZ clients however a delight. Yes! the thin end of the wedge of truth. I believe that innovation is missing from Australia business. It’s not the marketing department in isolation. We have bred company cultures of playing it safe. We hit our number, collect our bonus and expect to do the same thing next year. And when we don’t hit our number, department heads play the blame game and we promise to do better next year. We need to encourage innovation by creating safe environments for people to try and fail. Within all departments. Innovation requires risk, and if you’re working within an organisation that doesn’t tolerate failure, innovation simply won’t occur. It all starts from the top of an organisation, the board and executive team. After all the fish rots from the head! Yes! More of the wedge of truth. The future is AI, Dynamic Creative and API’s. Australia needs seniors leaders to take their businesses down this technology path and less complaining about how “crap” marketers are.